In the first essay, Habermas himself succinctly presents the centerpiece of his theory: his proceduralist paradigm of law. The following essays comprise elaborations, criticisms, and further explorations by others of the most salient issues addressed in his theory. The distinguished group of contributors—internationally prominent scholars in the fields of law, philosophy, and social theory—includes many who have been closely identified with Habermas as well as some of his best-known critics. The final essay is a thorough and lengthy reply by Habermas, which not only engages the most important arguments raised in the preceding essays but also further elaborates and refines some of his own key contributions in Between Facts and Norms. This volume will be essential reading for philosophers, legal scholars, and political and social theorists concerned with understanding the work of one of the leading philosophers of our age. These provocative, in-depth debates between Jürgen Habermas and a wide range of his critics relate to the philosopher's contribution to legal and democratic theory in his recently published Between Facts and Norms. Drawing upon his discourse theory, Habermas has elaborated a novel and powerful account of law that purports to bridge the gap between democracy and rights, by conceiving law to be at once self-imposed and binding. 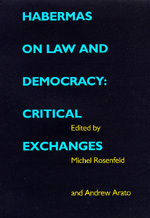 Michel Rosenfeldis Professor of Law at the Benjamin N. Cardozo School of Law and author of Affirmative Action and Justice (1991) and Just Interpretations: Law between Ethics and Politics (California, 1998). Andrew Arato is Professor of Sociology in the Graduate Faculty of the New School for Social Research and most recently co-author of Civil Society (1994).